Was there a Dinosaur Called Lufengosaurus? Home/Dinosaur Fans, Main Page/Was there a Dinosaur Called Lufengosaurus? An interesting question was sent in the other day by a young dinosaur fan. He wanted to know whether there really was a dinosaur called Lufengosaurus and if it existed, what sort of dinosaur was it? An intriguing question, so our team members set about providing an answer. Lufengosaurus lived during the very Early Jurassic in south-western China. Its fossils are associated with the Lufeng Formation (hence this dinosaur’s name). It was named and described back in 1941, a time when western science had very limited access to Chinese scholars and their work. This dinosaur remained very much off the radar for many museums and academics in the West. A second species was erected a few years later, but it is now thought that the fossilised remains associated with this second species are actually older, larger individuals representing Lufengosaurus huenei so this second species may not be valid. Lufengosaurus was named by the Chinese scientist Chung Chien Young (Yang Zhongjian). 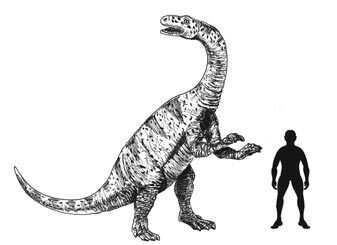 A scale drawing of Lufengosaurus. This dinosaur, one of the largest known from the Early Jurassic was a member of the lizard-hipped group (Saurischia). More specifically it was a Sauropodomorph and closely related to Massospondylus which also lived in the Early Jurassic (South Africa). In the mid 1980’s another species of Lufengosaurus was described, this time based on a specimen discovered in Tibet (Lufengosaurus changduensis) although this specimen has not been formally described and no holotype fossil material assigned so the species name currently has a nomen nudum status. The hind limbs were longer than the front limbs so this dinosaur could have adopted a bipedal stance, although it probably spent most of its time ambling along on all fours. The neck is proportionally longer than in other Sauropodomoprhs and it had distinctive lumps and bumps on its cheek bones. It was most likely entirely herbivorous, the jaw was lined with tightly packed teeth well suited to coping with a diet of tree leaves and ferns, although it possessed a disproportionately large thumb claw, which some scientists have suggested was used to attack and subdue smaller animals, suggesting that this dinosaur was an omnivore. Other palaeontologists have disputed this idea, proposing that the claws and that large thumb claw in particular may have been used for defence or to help pull down branches so that it could feed more easily.